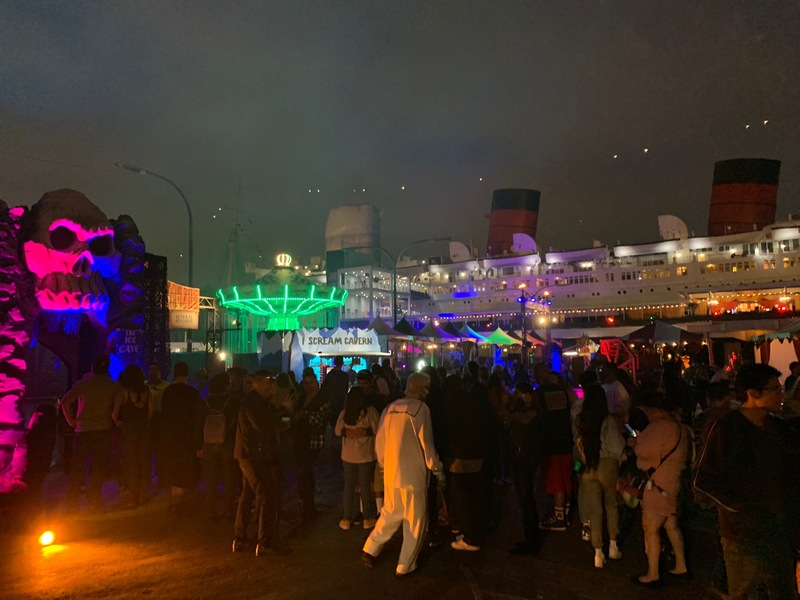 Queen Mary’s Dark Harbor charts a course to scare and delight visitors with 6 mazes, secret bars, and plenty of sideshows and attractions. 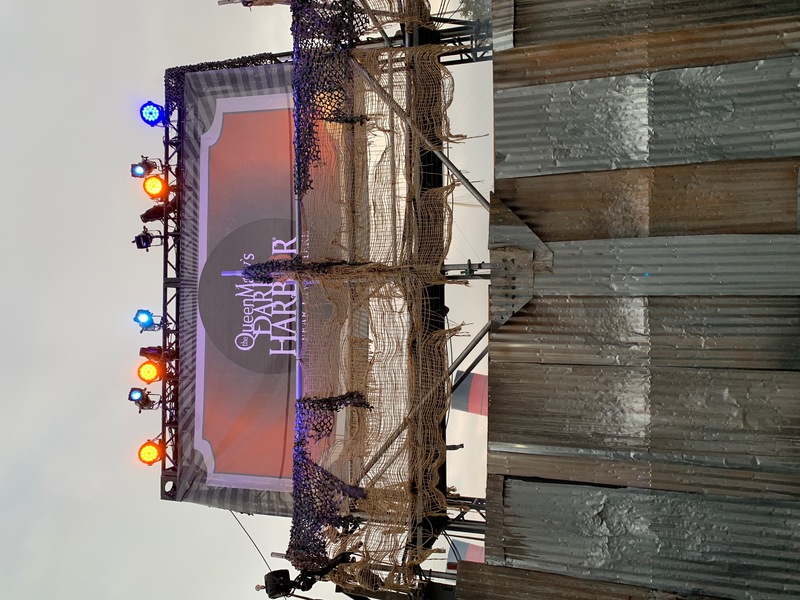 With no new mazes this year, Dark Harbor shifts its focus to revamping previous mazes and highlighting its sideshow offerings such as acrobatic performances, carnival rides, and enhanced bar options. 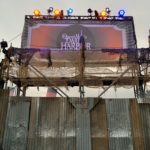 While it may be a little unfair to compare the design and theming to other SoCal attractions like HHN, Dark Harbor continues to be a formidable Halloween Haunt thanks to the extremely dedicated scareactors and the naturally creepy aura of the Queen Mary ship. All the mazes benefit from the location and while some may rely a little too heavily on that, they all have unique elements whether it be climbing up ropes, going down slides, or crawling through some of the ship’s passageways. 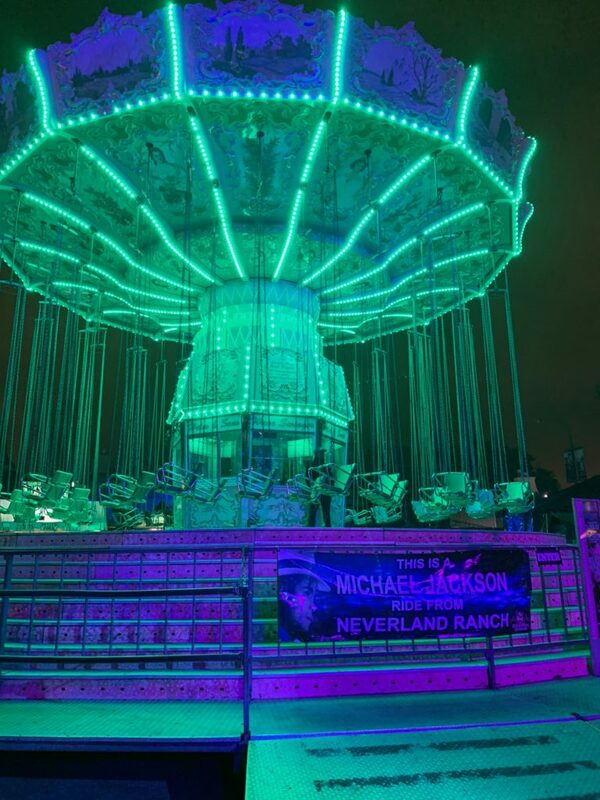 We recommend that you consider purchasing the “Fast Fright” ticket, as wait times ranged from 60 – 90 minutes during peak hours. 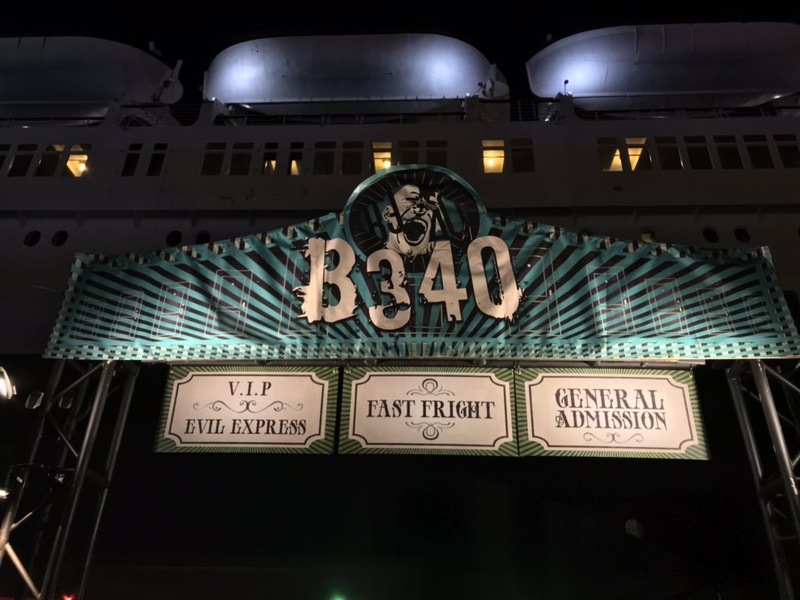 All in all, for its affordable price point, the number of mazes, and unique experiences, Queen Mary’s Dark Harbor is a fun date/friends night out at a haunt worth cruising through. It has been long rumored that Mary, the little girl who drowned in the Queen Mary First Class Swimming Pool in 1952, has haunted the dark corners of the luxury liner since her untimely demise. Many experts theorize the haunting derives from Mary’s spirit attaching itself to the little girl’s stuffed toy bear. Perhaps the bear holds the gloomy secrets behind the wicked ghost of Scary Mary and why she still sings her eternal Lullaby. 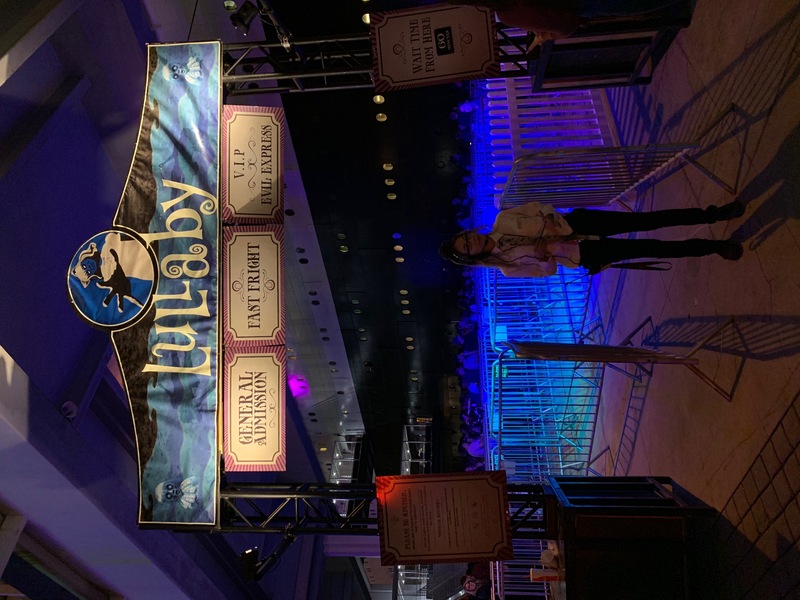 Our night began at Lullaby, which I can truly say lived up to its name, as the spirit of Scary Mary put me in an eternal sleep. 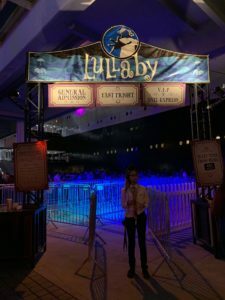 The first section of the maze gives hope that Lullaby will be creepy, as guests have to crawl through a small corridor, which leads to a room pumped with fog and LED lighting, to mimic a swimming pool. This effect was a great tool for scare actors to crawl and jump up at you while you maneuver around the room. But pretty quickly the maze disappoints as guests end up walking down long narrow hallways with sparse actors and predictable scares. Another reason this maze was a letdown, was because the overall story was hard to grab onto. For example, Mary’s teddy bear was supposed to be a big plot point, but there was never any mention of it, and instead, there is an actor dressed up as a monkey following you during parts of the maze. 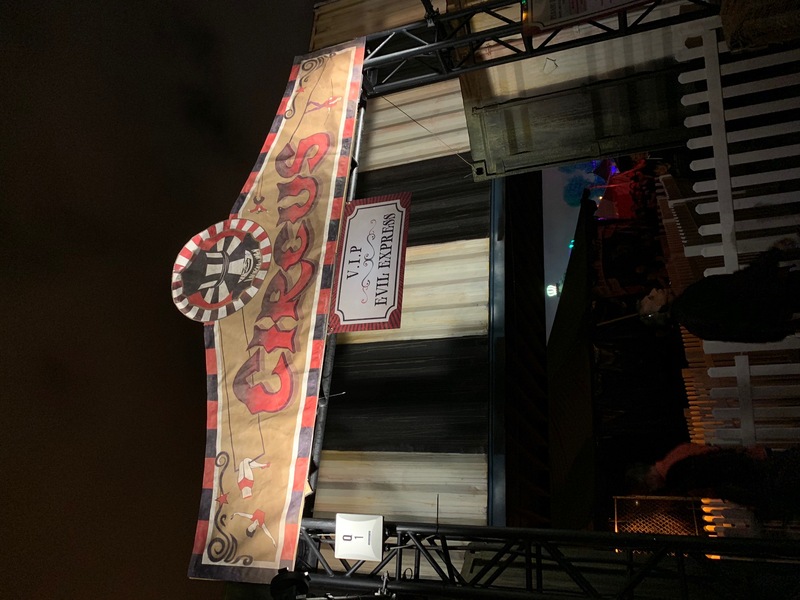 Eventually, you end up exiting to one of Dark Harbor’s secret bars, which makes you wonder if Scary Mary had a fake ID? A series of inhuman crimes tormented the Queen Mary passengers during a routine cross-Atlantic voyage in October of 1948. Follow the lead detective on the scene as he uncovers the evil truth behind one of the most notorious criminals to ever invade the luxury liner: Samuel the Savage. Samuel the Savage continues to haunt the Queen Mary and invites guests to enter a well designed and scary journey to discover the fates of his victims. B340 utilized the various victims, such as distorted demons, nuns, and crewmates to give each room a distinct theme. Similar to the other mazes, B340 also had long narrow hallways but managed to still have unique scares, such as actors hanging from the ceilings. Keep a close eye at the beginning for a trap door that leads to a secret bar with a two-way mirror where you can scare other guests. Chop-chop! It’s time to report for duty as the new line cook on board the world famous Queen Mary. However, all is not what it seems as the kitchens have gone dark and the smell of rank, rotting meat fills the air. 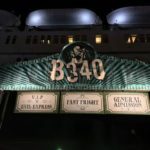 From dinner service to the kitchens, the angry spirit of an evil Chef washes back from a watery grave to serve the high-class Queen Mary passengers of 1948. Face the souls of poisoned travelers, gruesome ship staff and of course, the horrific Chef now serving the living to the dead. Let The Feast begin. For a maze with an overall fun theme of a haunted kitchen, and a cool central character in The Chef, we were disappointed that Feast didn’t take advantage of its potential. While Queen Mary tried to design the maze to feel like a gruesome kitchen, with hanging meat bags, cooking machinery, and a walk-in oven, it was hard not to notice that the maze was actually located in the engineering section of the ship – not quite the proper setting for a “dinner service gone wrong.” Strangely, there was no foul smell anywhere in the maze – which could have been used to create an unsettling environment. Finally, the maze had an awkward ending, with guests having to climb down 3 different flights of stairs, before going through the last room with a single unthreatening character. This is where The Chef could have been utilized, by including him in a big final scare. Also, why not a secret bar in the kitchen themed maze? It’s the night before a dust-covered, rickety old circus opens to the public. Sneak beyond the curtains to unveil the horrors lurking within the shadows of the big top. Hosting a menagerie of monsters and sinister creatures, the one and only Ringmaster returns with unadulterated and unbelievable horrors for all who step inside Circus! 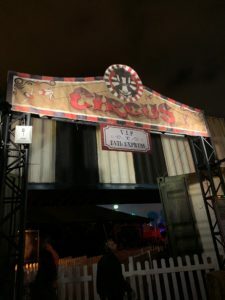 Circus has a unique twist on a classic theme, by showcasing a grim “behind the scenes” look at Circus life. Guests pass through rooms filled with scare actors that are dressed like drunken and tired carnival workers. 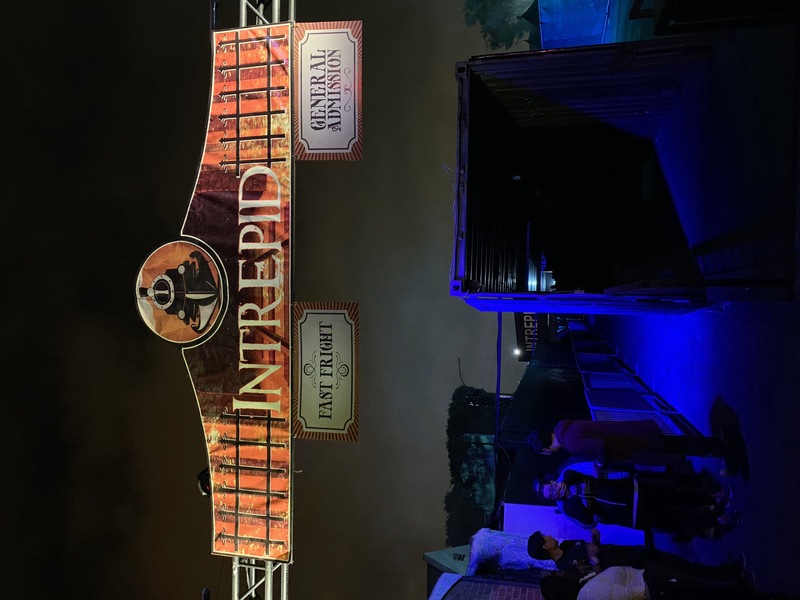 This maze housed one of the most effective scares of the night, by utilizing a trapeze artist (so don’t forget to look up). However, despite this, the maze overall was lacking on the number of scares. It felt more like you were walking around and enjoying the fun elements such as the vertigo tunnel and mirror maze instead of being scared. 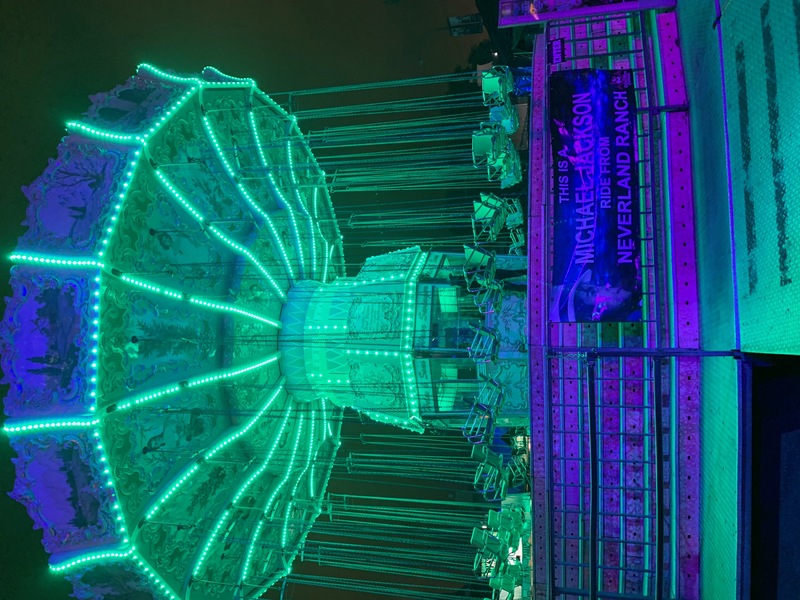 All in all, the colorful setting and costumes make it a fun contrast with the dreary elements of Dark Harbor. PS: When you get to the ball pit room, look for a side door that takes you to the next secret bar. All Aboard! The Ghost Train Waits…A phantom coach forces the Queen Mary’s original shipbuilder to relive his wicked wrongdoings to shipyard mates, Scottish brethren and plagued family that led to the Iron Hell his soul rots away in. Follow the spine-chilling path to an evil sea witch where a deadly pact was made spawning the horrific half-metal, half-creature known as the Iron Master. 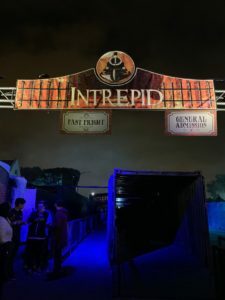 Upon entering the maze, Intrepid grabs your attention thanks to a frightful train car scare, and an awesome exterior setting of Edinburgh Station with falling snow. However, you quickly forget that this maze is supposed to be about going on a ghost train with the Iron Master and learning about his cursed construction of the Queen Mary. Makes you wonder if you missed the train and got left behind. The rest of the maze is filled with hallways covered in rope and mechanical parts, a room with fog/lighting effects to create a body of water like the Lullaby, and characters dressed in raven beaks. These elements seemed better suited for a shipwreck-themed maze. Overall, while the maze had some good scares, it was hard to follow the story of the Iron Master and felt half-finished. The Grey Ghost rises once again, set out on its annual ghastly voyage damned to its eternal battle on the living. With the fearless captain at the helm, guests will walk among the rusted carcass of the Grey Ghost as its full steam ahead into the flames of war. Those unfortunate enough to be caught in the ships warpath may either salute the captain or like an anchor, sink to the depths of the watery tombs. 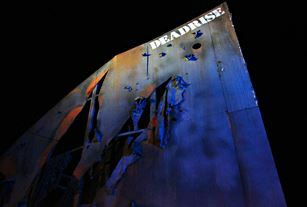 Deadrise is a needed break from the typical walk the same path maze, thanks to its “choose your own adventure” layout. Be prepared to crawl, climb, and go down slides at different parts of this maze. And don’t be discouraged if you end up getting lost, as this maze relies on confusing guests so they are disoriented and easily scared. 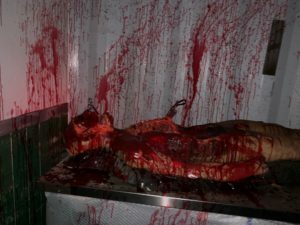 Deadrise is simple enough with its setup and backstory but is one of the best mazes at Dark Harbor thanks to a great group of actors, and the physical components of getting through the experience. 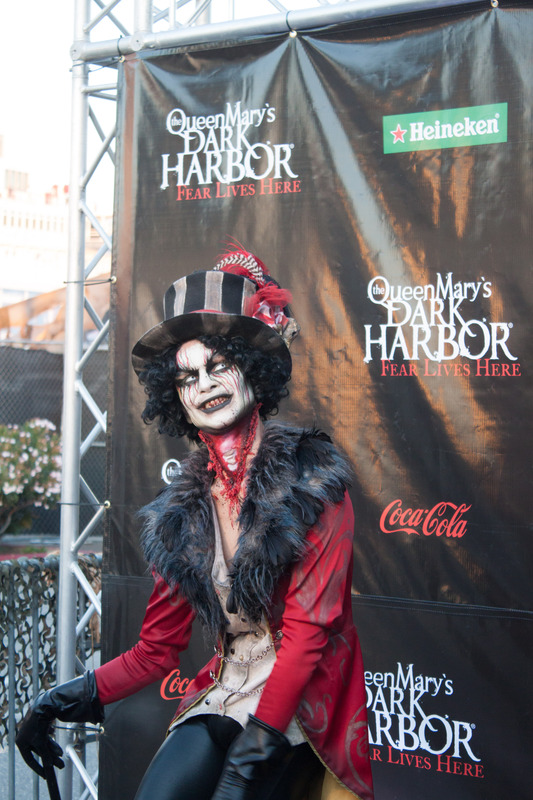 Queen Mary”s Dark Harbor continues to scare those who dare on select nights through November 2. General Admission ticket prices start at just $20 online with optional limited upgrades to Fast Fright, Evil Express, VIP, Ultimate Scream, Creepy Cabanas, and Private Patios (available while supplies last). For more information or to purchase tickets online, visit www.queenmary.com/dark-harbor.